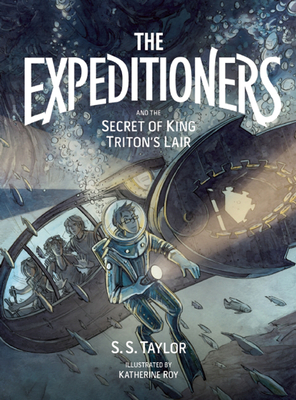 Tonight, S.S. Taylor, author of The Expeditioners and the Secret of King Triton’s Lair, will be signing copies of her latest novel at the Northshire Bookstore in Manchester Center. The event will start at 5:00pm. Book two of the award-winning Expeditioners series: The Expeditioners and the Secret of KIng Triton’s Lair! Kit, Zander, and M. K. West are settling into their new lives as students at the Academy for the Exploratory Sciences when Kit finds another mysterious map left for him by their father, the brilliant, famous — and presumed dead — explorer Alexander West. Why did Alexander leave the maps behind, and why are government agents so determined to seize them? What is really going on in a mysterious and unknown stretch of the Caribbean, famous for its violent storms and shipwrecks? And what is the huge contraption M. K. is building in her workshop? As two world powers come to the brink of war, Kit must find a deadly hidden island and unlock its secrets, hoping he has the courage to follow the trail of maps, wherever it may lead. This entry was tagged S.S. Taylor, The Expeditioners and the Secret of King Triton's Lair. Bookmark the permalink.